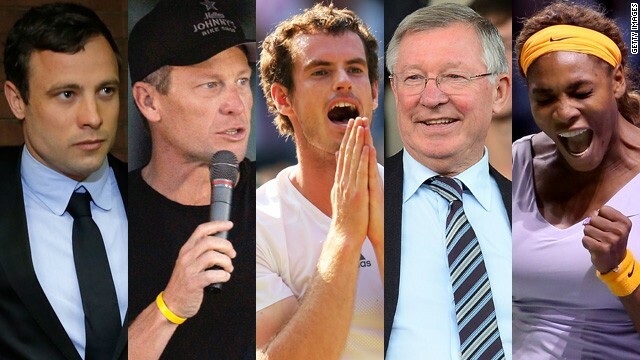 So what was your top sporting story of 2013? CNN's World Sport anchors share their leading selections below, and we'd like to hear your opinions too. Have your say in the comments box and vote in the poll. 1. ANDY MURRAY - For 77 years, British men had competed at Wimbledon, but failed to lift the title at their home grand slam. For 30-something of those, I had been one of the members of the British public watching, wishing, and waiting. And since 2005, Murray has been the player shouldering that burden. He had been edging closer and closer, reaching the final in 2012, then claiming Olympic gold, followed by the U.S. Open crown. But with every step closer, so the pressure valve cranked up a notch. It will never again reach the level it did in that final. Two sets, 5-4, 40-love up against world No. 1 Novak Djokovic. Murray said he couldn't breathe. And neither could a nation. But on match point number four, with a Djokovic backhand into the net, all the years of hurt were forgotten, a weight was lifted. Amanda Davies sat down with Andy Murray the morning after his Wimbledon triumph. Sitting down with the first British men's singles Wimbledon champion since Fred Perry in 1936, the morning after the night before, was a privilege. It may sound flippant, but he really did seem a changed man from the one I had spoken to before. 2. OSCAR PISTORIUS - I was awoken by the phone ringing in the early hours of the morning. The words I heard: "Oscar Pistorius has shot his girlfriend. She's dead." They were some of the most difficult words of the year to comprehend. Just six months after I'd interviewed Pistorius in London amidst the celebration that was the London 2012 Olympic and Paralympic Games, I was suddenly talking about a murder trial. There are still so many questions, and still a very long way to go until the case reaches court. But this was without doubt the most shocking and tragic sport story of 2013. 3. ALEX FERGUSON - You never dared believe this one would happen. But trust Sir Alex - aged 71 - to catch us all unaware. We were all ready for him to retire 12 years ago before he changed his mind. Twelve major titles later, at 0917 on the morning of May 8, the Manchester United press office announced the news with a simple tweet: "Sir Alex Ferguson retires. #thankyousiralex." As a lifelong United fan, I didn't need any encouragement to wax lyrical about "The Boss." But his impact in his 27 years at Old Trafford was so great that there was more demand for coverage of this breaking story from Manchester than any other that I've covered in my time at CNN. Not just from sports shows, but news, and business too - in America, Europe and Asia. The man who saw off the challenge of Liverpool, Newcastle United and Arsenal. The Scot who led some of the best players the Premier League has ever seen - the likes of Eric Cantona, David Beckham, Cristiano Ronaldo, Ryan Giggs and Ruud van Nistelrooy. The struggles of his successor David Moyes simply serve to highlight what an incredible job he did. 1. ANDY MURRAY - There are waits, and then there’s the wait that Britain endured between men’s singles champions at Wimbledon. Seventy-seven years is a long time and Andy Murray proved that patience and perseverance can indeed pay off. 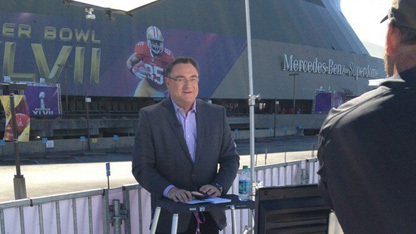 Mark McKay reporting live from SuperBowl XLVII in New Orleans back in February. Winning Olympic gold at London 2012 on the hallowed grounds of the All-England Club no doubt boosted his confidence. Winning his first grand slam in New York City three months later laid the foundation for his inspired performance in this year's Wimbledon final where he beat 2011 champion Djokovic in straight sets. 2. OSCAR PISTORIUS - “Inspiring” is one of the words most commonly associated with Oscar Pistorius. He overcame a birth defect to become a Paralympic champion and an Olympian. Pistorius represented his nation around the world with a squeaky clean image that was a sport marketer’s dream. On Valentine’s night 2013, Pistorius was at the center of a tragedy that shook South Africa to its core when his girlfriend Steenkamp was found dead at his residence. Pistorius was charged with murder and has maintained his innocence. A trial date is set for March 2014. 3. LANCE ARMSTRONG - When someone denies, denies, and denies the presumption of innocence exists on some level. For Lance Armstrong, years of denials failed to clear the cloud of suspicion that constantly hung over the seven-time Tour de France champion. Facing a mountain of evidence, and having his Tour titles stripped, Armstrong did what many believed he’d never do: Admit on the record that he took performance-enhancing drugs. January’s television interview with Oprah Winfrey was, at times, uncomfortable to watch as a sportsman who meant so much to so many confirmed what many refused to believe. Perhaps there were lessons learned from Armstrong’s confession - not for the cyclist himself, but for those of us who hold athletes in high esteem. 1. ANDY MURRAY - Most Brits wouldn’t consider themselves "tennis fans"’ but many of us tune in for a fortnight every summer to watch Wimbledon, hoping that a homegrown player will finally end the drought in the men’s championship. With Roger Federer and Rafael Nadal crashing out early, we knew that Scotland’s Andy Murray might never get a better chance, and he seized it with a dramatic win against Djokovic in the final. I wish I’d been there to see it, but I called it live on World Sport and because I knew what it meant to the country and Murray himself, I had to keep my own emotions in check for our global audience! It was Rafa’s year, but this is my top three so I’m going with Murray! 2. OSCAR PISTORIUS - The news that Pistorius had shot his girlfriend Reeva Steenkamp to death was certainly not a great sport story, but it was one that dominated our headlines back in February. Amanda Davies spoke with Oscar Pistorius during the London 2012 Olympic Games. Unlike Lance Armstrong’s mea culpa, this was a shocking event that took all of us by surprise. I had previously met Oscar, and found him to be a charming and inspirational young man; whatever the outcome of his trial next year, all that he has achieved and everything uplifting that he stood for will be forgotten. For everyone concerned, it’s a desperately tragic tale. 3. BAYERN MUNICH - For so long, Barcelona have dominated the European football narrative but it all ended that night in April when they were thrashed 4-0 by Bayern Munich. The Bavarian giants effectively booked their place in the final after the home leg of their semifinal and within a matter of weeks, Bayern had won the European Champions League, the Bundesliga and the German Cup - an unprecedented German treble that had eluded them twice before. It was hard not to be impressed, and just as Bayern were emerging as the pre-eminent force on the continent, they recruited Barca’s former coach Pep Guardiola. The early signs are that they might now be even better. 1. LANCE ARMSTRONG - 2013 will be forever known as the year Lance Armstrong came clean. The athlete who had conquered cancer appeared to have it all. The worldwide respect and admiration of millions. His legacy seemed untarnished. In January all that changed when the Texan admitted to doping in a two-part television interview. With that, in one fell swoop, went every last ounce of credibility. Cycling’s ultimate fighter, the one I’d once in vain chased down the Champs-Elysees in Paris for an interview after yet another “triumph,” had fallen flat on his face. After a career spent denying it all, Armstrong’s mea culpa was at least one step in the right direction, though I’ll never fully grasp why he continues to believe he was being “ singled out” and targeted by USADA. The Oprah interview answered some questions but left many unanswered. My challenge to Lance now: There’s still time, but only for the whole truth and nothing but the truth! 2. ALEX FERGUSON - In a way it was entirely fitting Alex Ferguson chose 2013 to finally end his illustrious Manchester United career. He had just won the club's 20th English title while at the same time securing his 13th since taking over Britain's biggest club in 1986. I've gone for "Fergie" quite simply because of the sheer enormity of it all. Twenty-six years at the helm, 1,500 matches in charge and 38 trophies - a glittering haul that also included five English FA Cups and two European Cups. But it's not just that Ferguson was a winning machine, it was also his dedication in nurturing young talent that will live long in my memory: Scholes, Giggs, Ronaldo and Beckham. Another key reason for his unparalleled success was Ferguson's ability to rule United with an iron fist. Just ask Roy Keane, Van Nistelrooy or even Beckham, who he abruptly sold to Real Madrid in 2003. No one player was ever bigger than Manchester United. In terms of durability and his relentless winning mentality over the course of three decades - if you include his successful period at Aberdeen too - he simply has no match. For many, including myself, he rightly goes down as the best ever. 3. ANDY MURRAY - I simply couldn't omit the credentials of Fergie's fellow Scot Andy Murray. He makes my top 3 just because - to put it in plain English - he did it. Finally! Never again will I have to pen those weary words: "No Brit has won Wimbledon since 1936." He'd been threatening it for a good while and it was certainly well merited. While I do wonder how many slams he'll eventually go on to claim, nobody can ever take this one away from him. As someone who's covered Wimbledon at the All-England Club I've witnessed first-hand the agonies of the long-suffering British public. A momentous achievement - one which even triggered an all-too-rare smile from Murray. Now I guess I'm reduced to writing "No ENGLISHMAN has won Wimbledon since 1936!" So there you go. My top 3 picks for 2013. Oh, and to think I never mentioned Australia regaining the Ashes! 1. BATTLE AGAIN RACISM IN FOOTBALL - Kevin-Prince Boateng walking off the pitch during a friendly for AC Milan back in January sparked football's fight against racism into life. A huge groundswell of support for his response to abuse from the stands from fans of lower league team Pro Patria finally forced the sport's governing bodies into action. 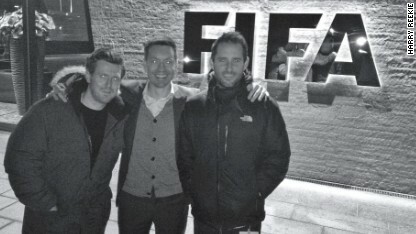 Alex Thomas and CNN crew on the ground at FIFA Headquarters. FIFA set up an anti-racism task force and sanctions are being unified and toughened across all federations. Now it's up to the authorities to enforce those new rules and mirror society's growing intolerance for inequality and discrimination. For me, it narrowly trumps Nigeria's African Cup of Nations victory over plucky Burkina Faso - which I was lucky enough to be at - and Bayern Munich's all-conquering season, culminating in their fifth Champions League triumph. 2. SERENA WILLIAMS - In tennis, Serena, in the year she turned 32, has been extraordinary; Just four defeats, and 11 titles from 16 tournaments including two grand slam victories. She's the first woman to earn $10 million in prize money in one season. In my opinion, that puts her narrowly ahead of Rafael Nadal - who returned to the top of the men's rankings, and Andy Murray's emotional Wimbledon win. 3. HENRIK STENSON - Ranked as low as 207th in the world at the start of 2012, Henrik Stenson's climb back up golf's rankings has left him breathing down the necks of Tiger Woods and Adam Scott. It was simply great fun to watch the Swede play in scintillating, swashbuckling fashion as he became the first to take the PGA Tour's FedEx Cup and Europe's equivalent, the Final Series. 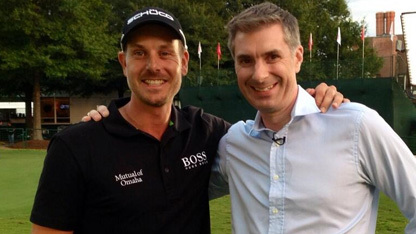 Don Riddell interviewed Henrik Stenson for CNN's Living Golf show. Sachin Tendulkar retiring from international cricket after 24 years. He practically holds every record possible. A great ambassador of the game and a legend in its truest sense. Sebastian Vettel broke so many records this year, he has to at least be mentioned as one of the "2013 sports stories"
Abou Trieka's retirement, Egypt's best football player, is a big story that hasn't taken much of a fuss that it deserved. As he, Abou Treika, hadn't had played in Europe, he was underrated and was not known to the world although his acheivements have surpassed those of many well-known African players. He declared his retirement just few days ago. Sadly, even the correspondets in CNN haven't noticed it. Not sure about 2013 but just watched on CNN USA a look ahead at sports events for 2014, no mention of World Cup, like it isn't happening. Only CNN USA can be that provincial. Why Andy Murray there, only won one tournament, where is Vettel. The biggest sports story of 2013 was Australia trouncing England in The Ashes test cricket series and the failure of CNN's pro-English anchors, Patrick Snell and Don Riddel, to give it the coverage that it deserves . . . something they would have gleefully done had the English won or been winning. Shame on them!!! P.S. And, I'm not an Aussie, but I love test cricket. Idk about the Biggest story in 2013 but there is a huge one for this year – A Football Playe name Antoine Morgan from Pittsburgh Pa is making big headlines as being the shortest player in NFL history at 5"1 150pds & running a 4.3 in the 40 yard dash look him up this kid is amazing! Tubs, I wondered the same thing. Andy Murray winning Wimbledon was nice and a pretty big story, but he was born and raised in Scotland, not England. Serena's amazing dominance after coming back from life-threatening illness is the biggest story of the year. Venus just overcame an auto-immune diagnosis to win a Premier event without dropping a set. The Williams sisters' parents did something right. Sachin Tendulkar played international cricket for almost quarter of a century. Tremendous story of grit, determination, class, style, dedication, perseverence and an honourable exit from the Gentleman's Game.